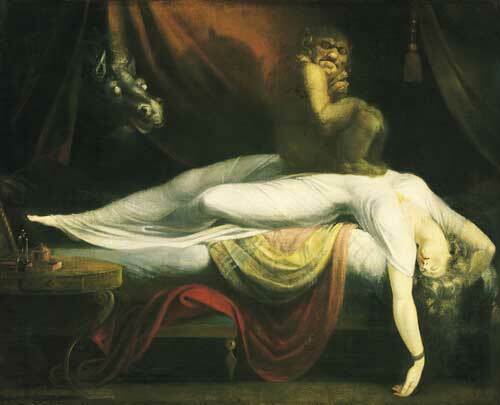 Cultures throughout the world historically blamed sleep paralysis on ghosts, witches or demons. In our times it is responsible, in large part, for reports of alien visitations. In countries as far apart as Nepal and North America, the incident is described nearly identically. Something or someone is holding the person down, keeping them from moving. Some people say that they have “seen” a small figure, about the size of a child, sitting on their chest. The phenomenon of seeing the small child on the chest is particularly common among the Hmong, an Asian ethnic group of people from the mountainous regions of Burma, Vietnam, Laos and Thailand. American Hmong are prone to suffer from “Sudden Unexpected Nocturnal Death Syndrome” or SUNDS, a term created by the Centers for Disease Control. SUNDS is believed to be a genetic condition. Victims die as a result of sudden heart attack, without the presence of underlying heart disease, which would explain the sensation of pressure on the chest, but is not really related to common sleep paralysis. Although spells, curses, demonic possession and poltergeist have been blamed, this is actually a normal occurrence, one that is not usually dangerous and not indicative of an underlying medical problem. The brain shuts down nerve impulses and prevents muscle movement when a person is in a dream state or REM (rapid eye movement). Sleep Paralysis Depiction by Johann Heinrich Füssli in "The Nightmare"
This is a preventative measure that prevents us from acting out our dreams. Thrashing about in the bed or moving our arms and legs in tune with what is going on in our dreams would interfere with our rest and could cause bodily injury. People experience REM differently. Although popular thought may be that dreams occur during the deepest of the sleeping stages, our brains are actually closer to being awake, in terms of electrical activity, than to being sound asleep. There is a stage between the state of being fully conscious and being in the dream state. It has been difficult to identify the stage exactly on EEG monitors used during sleep studies, but it is in this in-between stage that sleep paralysis is experienced consciously. It is ongoing throughout our dreams, but we are usually unaware of it. Becoming aware of it is scary. People are awake and conscious of their surroundings, but they cannot move. Sometimes in troublesome dreams, we feel the need to run, fight or cry out, but we cannot move in the dream state. It is theorized that the brain activity during those dreams is similar to what is going on when someone is awake and conscious of sleep paralysis. The experience seems to be somehow related to lucid dreaming and out of body experiences. In lucid dreams, people are aware that they are dreaming. They may fight to wake up if it is an unpleasant dream or they may continue try to control the action, in some way; make the dream turn out in a way that they would like. A similar experience is the false awakening, in which someone dreams that they have gotten up out of bed, performed their daily rituals and gone about their day, only to wake up in bed. False awakenings have been known to happen repeatedly and are sometimes referred to as dreams within a dream. If you experience sleep paralysis, the best thing to do is to relax. Being afraid probably accounts for the sense that a dark force is holding you down. It is possible to learn to control the experience and even bring it about during meditation. People that learn to do that say that they are able to enter the dream state more quickly and remain lucid during their dreams. They also enjoy the out of body experience, a sensation of floating above one’s own body. In other words, not everyone feels that sleep paralysis is a bad thing. You might learn to enjoy it.